My Media, Ethics, and Society course at the University of North Carolina at Asheville is both the introductory course to the mass communication major and an elective for students across campus. We cover the ethics of mass communication practice as well as media history. There is a lot of content to cover, and traditionally I approached the course in more of a lecture format. The project engaged students in the course content as they took ownership of building their knowledge in a major topic area. In my course, the digital scholars project advanced all three of these objectives. Only 8 percent of the students in my class had prior experience working with interactive timelines. We dedicated a session early in the course to learn about creating timelines using the TimeMapper platform. 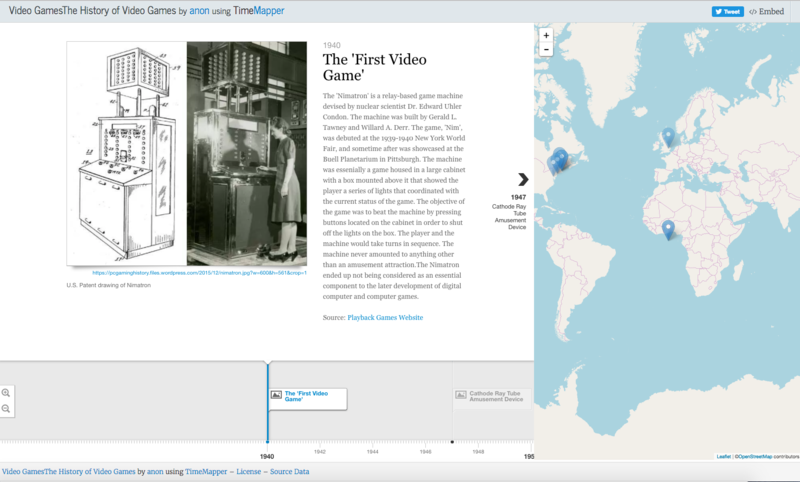 TimeMapper is a free interface for organizing information using interactive timelines and corresponding maps that plot and describe events in the timeline. Student teams then conducted research on their topic areas and selected the elements to include in the timelines. I challenged students to go beyond the facts and dates readily available in the textbook. The students delivered and introduced many lesser-known events and people while charting the history of their assigned media. After students had a few weeks to develop their content we turned our attention to learning WordPress, which was the content management system we chose to house the team projects and to host the course homepage. While most students are familiar with WordPress and have accessed sites published in this format, only 28 percent of those in my course had prior experience using WordPress as a CMS. Students were quite creative in how they organized their information. Some groups used a single chronological timeline placed on a WordPress front page while others organized their content into subcategories and created multiple links. The entry on video games, for example, is broken out into a time map, an image library, interactive online games, and a video library. 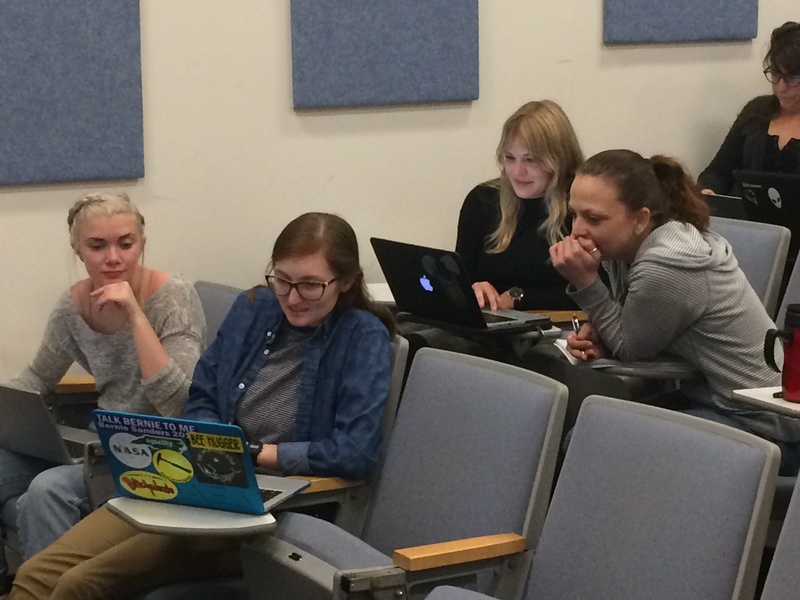 The project worked well in my introductory-level course of 30 students. The class was small enough to have a manageable eight teams, but large enough that the students benefited from the opportunity to work together and to get to know each other. Since this was a pilot project and we mostly built the plane while flying, I made the project “high-stakes/low-stakes.” I made the project worth a lot of points (the same as a midterm exam) so students would be invested, but I told students that if they worked hard and did their best they would get full credit. This helped head off a lot of student anxiety of advancing into unchartered territory with me, and their work was very strong. The students valued the digital scholars project with 77 percent recommending that I keep the project as part of the course in the future. In future semesters, our class will further develop the WordPress site by adding new topics. Previous entries will be edited, updated, and expanded. Ultimately, this site will serve as an educational resource for all students taking the course. I encourage you to integrate a digital scholars project in one of your own courses. You will invigorate your students, provide new skills, get students engaged in course content, and most importantly, you will design an environment where students can collaborate and have fun while researching, learning, and creating. Don Diefenbach is professor and chair of Mass Communication at the University of North Carolina at Asheville. He teaches mass communication, video production, and film studies courses. His research centers on cultivation analysis, media violence, and portrayals of mental health issues in the media. His textbook, Video Production Techniques: Theory and Practice from Concept to Screen, is published by Routledge. The author would like to thank John Myers, Anne Ogg, and especially Laurie Miles of the Teaching and Learning with Technology Resources office at UNC Asheville for their support in making his digital scholars project possible.